Most of us are pretty good at calling someone out when they say mean, untruthful, or outrageous things. 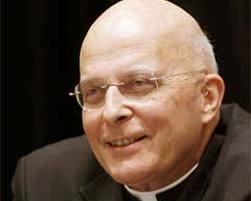 Thus, it was no surprise that recent remarks made by Chicago’s Catholic archbishop, Cardinal Francis George, comparing the gay rights movement to the Ku Klux Klan were met with justified outcry and condemnation. Just as quickly as we stand up against that which is wrong, we must also stand up quickly in support of that which is right. Cardinal George deserves to be thanked for recognizing the real impact of his words and the potential harm they could have done, had they been left as is. He should also be thanked for providing the example of what any Christian should do whenever he recognizes he has made a mistake. The simple word “sin” has many variations in our Hebrew and Greek patrimony. Among these various terms are words that mean “missing the mark” or suggest that a relationship has been harmed or broken. Cardinal George’s apology publicly recognizes that whatever point he was trying to make, his comparison to the KKK was way off the mark. He also recognizes that words are powerful — they can both build up and tear down. While they can never be unspoken, they can and must be corrected whenever we realize that something we have said has done harm to others. This, Cardinal George has done. And for that, he should be thanked. My prayer this Saturday morning is that the Cardinal’s apology will be welcomed and met with forgiveness. Perhaps this will be the dawn of a new day in the Church, and I pray that a spirit of reconciliation will help create an atmosphere of openness and dialogue between Church authorities and those of us who seek a deeper and richer theology of sexuality in light of the lived experience of God’s LGBT children. This entry was posted in Commentaries, Current Events and tagged Cardinal Francis George, forgiveness, reconciliation. Bookmark the permalink. ← Finally, a Catholic Politician to be Proud Of!